Today the world nuclear capacity is around 370 GW, providing 2.1% of the world energy supply (see Part A - PDF). 2.1%? It's common knowledge around here that the actual share is about 6 percent, so I checked the reference. What I found was stunning. The above table is trying to do two things. One is to show the amount of total energy consumed by fossil-fuels. The other is to show the amount of electricity produced by each energy source. Columns 6-8 are correct, columns 2-5 are not. I’m sure the statisticians in the crowd have already spotted the error. But for those who are less numerically-inclined, here's some background on how energy units are derived before I jump in to debunk these conclusions. Each fuel source contains different amounts of energy (heat) which can be measured in British thermal units (Btus). Examples: One short ton of coal contains about 20 million Btus. One cubic foot of natural gas contains a little more than 1,000 Btus. One uranium fuel pellet contains 19 million Btus -- nearly equal to a short ton of coal. The tricky part of energy conversions is understanding how much heat is needed to generate electricity, drive a car, fly a plane or burn/fission any fuel source. According to EIA, it takes about 10,000 Btus of heat to generate one kilowatt-hour of electricity from nuclear and fossil-fuel plants (nuclear is slightly more). Therefore, one short ton of coal or a uranium fuel pellet will generate about 2,000 kWh. One cubic foot of gas will generate about 0.1 kWh. However, only 3,412 Btus of heat are needed to generate one kWh, not 10,000 Btus. 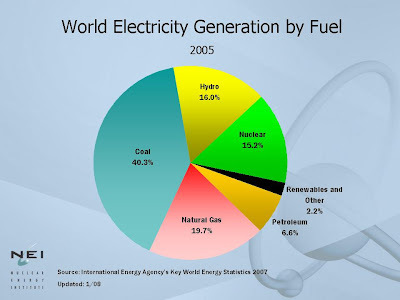 If this is the case, then why do coal, gas and nuclear plants need many more Btus to generate one kWh? When converting thermal energy (heat) to mechanical energy (turning a turbine), energy is lost in the process. Most coal plants and all nuclear plants are steam power plants which use the Rankine cycle. This cycle loses about two-thirds of its energy to generate electricity. The newest "combined cycle" plants (heat rates of 7,500 Btus/kWh) are a combination of the Rankine cycle and Brayton cycle, hence the name combined cycle. This technology loses only 50-60 percent of the energy in the process instead of about 67 percent with steam plants. Why do we care about these conversion figures? So we can calculate our energy supply and consumption into one primary energy unit like a Btu, joule or ton of oil equivalent (Toe). When converting all energy sources into one primary unit, we can derive and compare how much energy we use from all sources. Their first mistake was using multiple sources to compare like figures. This mistake would hardly be enough to post about, but the multiple sources with different numbers confused them and ultimately revealed their flaw. The International Energy Agency, Energy Information Administration and British Petroleum all report slightly different figures. EIA uses primarily Btus in their reporting, while BP and IEA use million tons of oil equivalents (Mtoes). Even though BP and IEA use the same units, the data sets still differ. When SLS researched the data, they found the nuclear and hydro generation from BP but didn’t find the fossil and renewable generation. The reason was because BP didn’t publish them. SLS then tried to find a comparable stat using IEA and that’s where the trouble starts. The only fuel numbers from BP equivalent to each other are the Mtoes which can be found on page 40. These are the only numbers SLS should have used from BP. Their second mistake (and the most egregious) was believing terawatt-hours and Mtoes can be equally converted to the same units (exajoules) in column 4. 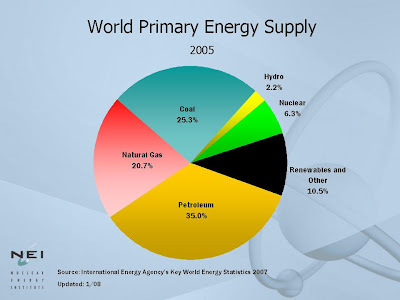 The “actually generated energy units” (columns 2-5) has to exclude the Mtoe of fossil fuels. By including the Mtoes, they are actually counting fossil-fuels’ total energy supply and not excluding the losses from thermal conversion. This overstates fossil-fuels’ energy supply by nearly a factor of three. There is no ambiguity in counting kilowatt-hours and the reason for the inconsistencies is clear. It’s because the data are from two independent sources and they have different methodologies for reporting the data. If we compare the primary energy stats between the two (see IEA's data in chart below), we find they are close enough to each other except for hydro and renewables. Since hydro generation is only mechanical energy and not thermal, IEA does not account for any conversion losses. IEA does capture the renewable and biomass figures which BP does not. Thus the inconsistencies are clear. The above quote is hilarious. SLS attempts to account for their mistake by citing the First Law of Thermodynamics. Yet, the First Law, as shown in my synopsis above, has nothing to do with calculating energy statistics. Some of you may be thinking I’m focusing too much on this one error. However, this one error represents a complete lack of knowledge for analyzing and calculating energy statistics. If SLS do not understand the differences between terawatt-hours, tons of oil-equivalents or joules, how can anyone believe what they say or write? When investigating SLS’ Part A (PDF), it took me quite awhile to understand what they were writing. But once I understood, I figured out why so many people have come to believe these authors. It’s because they make energy statistics sound so complicated, they must be right. The unfortunate truth is that they don’t understand the basic principles of energy statistics, and because the general public isn't schooled in the basics either, nobody notices the incredible and inexcusable mistakes that they continue to make. Unfortunately for the global environmental movement, such mistakes -- sometimes inadvertent, sometimes on purpose -- continue to have a poisonous effect on the public debate, distracting us from the truth and leading many authorities to base public policy decisions on data that are erroneous and have no basis in fact. The idea for this book was born in a bookstore in Los Angeles in February 1997. I was standing leafing through Wired Magazine and read an interview with the American economist Julian Simon, from the University of Maryland. He maintained that much of our traditional knowledge about the environment is quite simply based on preconceptions and poor statistics. Our doomsday conceptions of the environment are not correct. Simon stressed that he only used official statistics, which everyone has access to and can use to check his claims. In the fall of 1997 I held a study group with ten of my sharpest students, where we tried to examine Simon thoroughly. Honestly, we expected to show that most of Simon's talk was simple, American right-wing propaganda. And yes, not everything he said was correct, but -- contrary to our expectations -- it turned out that a surprisingly large amount of his points stood up to scrutiny and conflicted with what we believed ourselves to know. As I said earlier, if you can't trust the numbers that SLS publish, how in the world can you trust their conclusions. For a look into our archives where we've checked their math and challenged their conclusions, click here. So he is defaming the industry... Imagine if a journalist wrote that American Airlines had crashed 6 planes in the last year and therefore recommended people stay away from that airline company. Van Leeuwen is a member of the Dutch Club of Rome, no surprise there. Can Flex-Fuel Cars Break OPEC? Should America Build More Nuclear Power Plants? Hawaii to Repeal Nuclear Moratorium? Reuters Report on New Nuclear Build in the U.K.